Most lighting designers of my acquaintance have picked up dozens of swatch books over the years—thick, stubby sample packs of lighting gels from various manufacturers, intended to help designers pick the correct color filters for stage productions, among other things. Swatch Swap: Gel Swatch Library makes it easy for lighting designers to compare similar and complementary colors. While swatch books are essential tools in the creative process, referring to them is sometimes unwieldy, and the books themselves tend to disappear during productions. Wybron’s Gel Swatch Library brings these swatch books to the iPhone and iPod touch in a convenient interface. Gel Swatch Library includes a decent selection of swatch books from three companies—GAM, Lee, and Rosco. 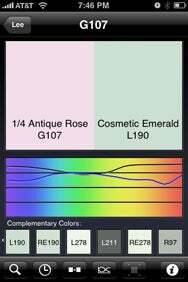 The app makes it simple to compare similar and complementary colors from all these manufacturers, as well as search and browse for specific colors. While the comparison feature is useful, I noticed some text overlap when comparing gels with long names. When viewing gels, the application displays a wealth of useful information, including the SED curve, and CMY transmission percentages. The application maintains a history of viewed gels, but it would be more useful to allow users to create their own lists, perhaps based around productions. Of course, Gel Swatch Library won’t cause any designers to throw out their swatch books—the application simply can’t replicate looking at a physical gel sample. But with some improvements, Gel Swatch Library could be a valuable reference for lighting pros. Gel Swatch Library is compatible with any iPhone or iPod touch running the iPhone 2.x software update.